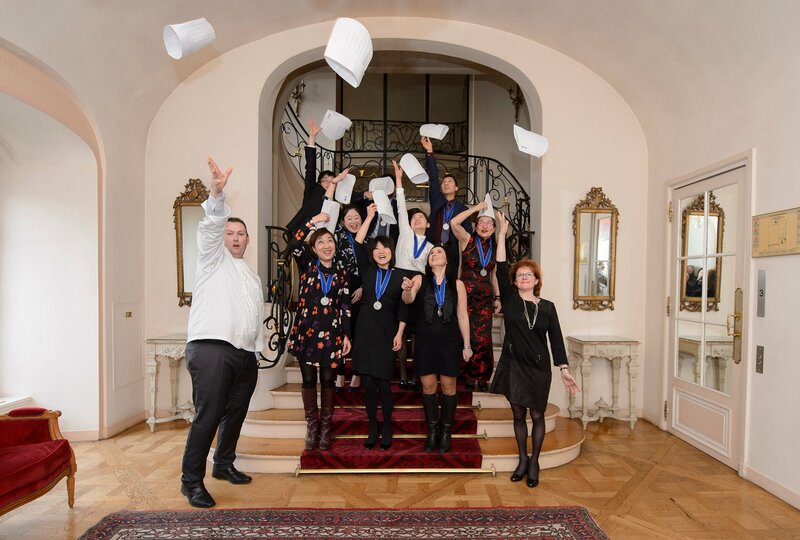 The first graduation ceremony of Le Cordon Bleu Paris Boulangerie students took place on February 26, 2016. Developed by Le Cordon Bleu Paris, the Boulangerie Diploma trains future professionals and entrepreneurs in essential boulangerie techniques, as well as new trends in the field. The ceremony was held at the ‘Cercle de l’Union Interalliée’ with graduates family members and friends. For this first promotion, composed of 9 students of 6 different nationalities, Le Cordon Bleu Paris was honoured to welcome Nordine Hakkam as class patron. Former sportsman, Nordine Hakkam, is passionate about artisan bread and this led him to refocus his career on that of his grandfather who was a baker. He was awarded his boulangerie CAP in 1996. His career began with Michel Moisan who had just opened an organic bakery on avenue General Leclerc in Paris 14th arrondissement. Between 1998 and 2000, he perfected his skills with Éric Kayser on rue Monge in the 5th arrondissement. In 2000, he went into partnership with Éric Kayser on rue Linois in the 15th arrondissement and went on to open a second boutique with him on rue de la Glacière in the 13th. From 2004, he developed a group of artisan bakeries in Paris. In 2014, with Michel Moisan’s backing, he returned to his roots and acquired the Moisan group from the Bertrand group, wanting to refocus on the restaurant business. Nordine loves bread and firmly believes in the importance of a job well done. He also knows how important it is to choose the best raw materials and to be fully in control of the fermentation that develops when bread is baked and which produces an infinite variety of aromas in a similar way to wine. For him, the human factor is integral to his success, and that is why he helps young bakers to set up their business or to get their foot in the door by becoming partners in bakeries. You are the representatives, of a noble artisanal profession, whatever you do, do it well and with your heart. Chef Instructor Olivier Boudot brought this ceremony to a close with a moving speech thanking the students for their participation over 6 months, which concretised two years’ work of preparation. Le Cordon Bleu Paris congratulates all the Boulangerie Diploma students of this first promotion! We wish success to all our graduates.